These are some pictures of some of my work – both completed and in-process. This is a hat that I made for one of my best friends, Ian. 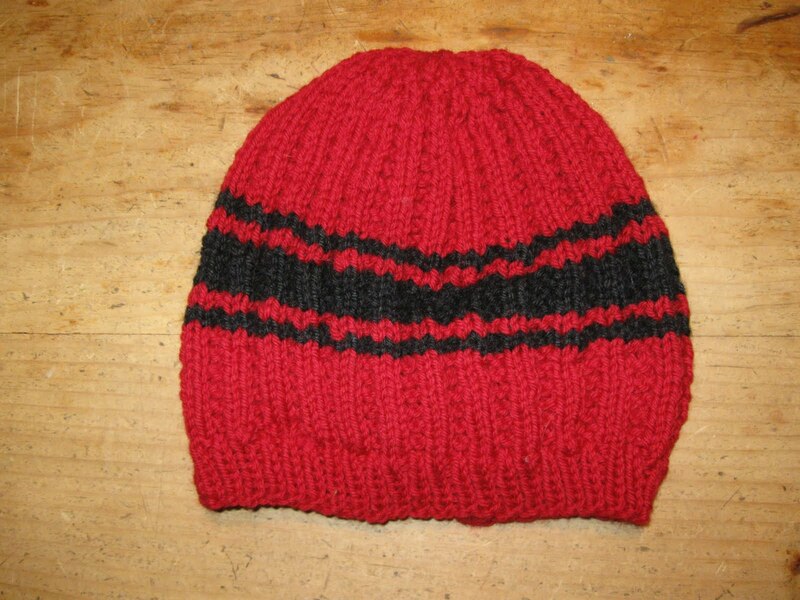 He picked out the red Peruvian wool, and the black is some stuff I had lying around that I decided to add some stripes with. 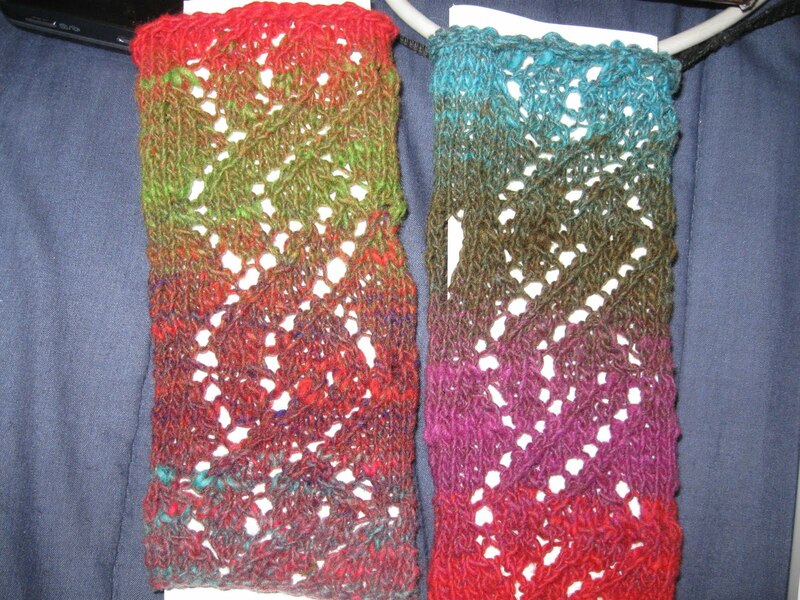 It’s always fun getting two different yarns of different weights to work in the same pattern! 🙂 I actually ended up making this hat twice, because the first time I vastly miscalculated the size of Ian’s head. No offense Ian. 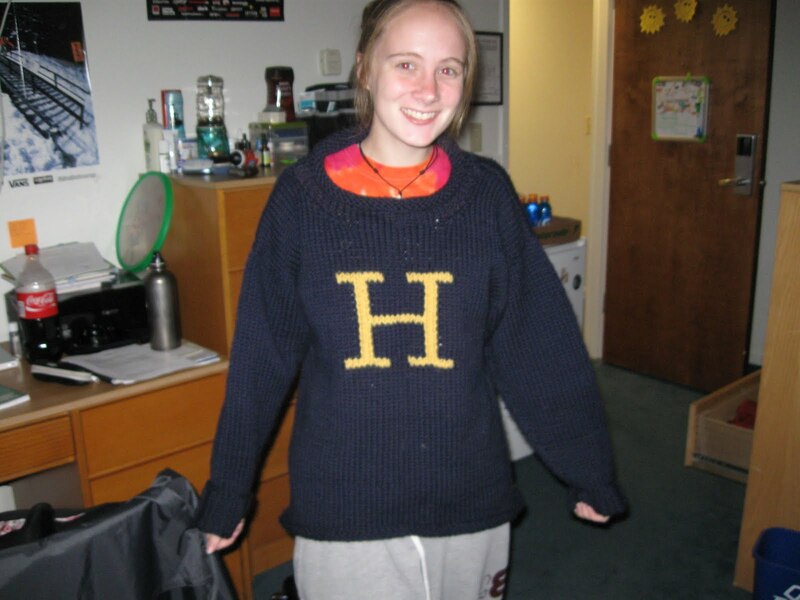 This is my WONDERFUL roommate/best friend Liz wearing the “Weasley” sweater I made for her over the summer. This was so much fun to make, from beginning to end. 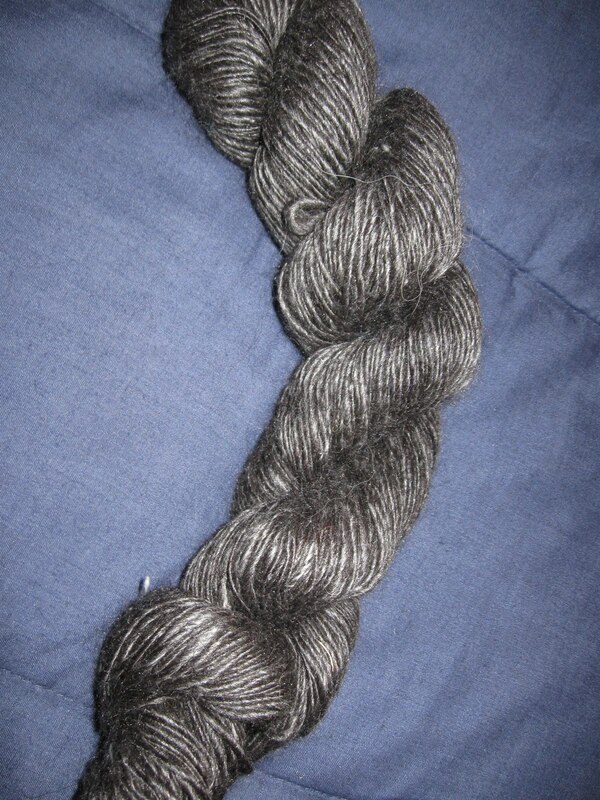 Karen and I spent ages at a Webs tent sale finding just the right yarn in just the right color, and after that it knit up in about three weeks! 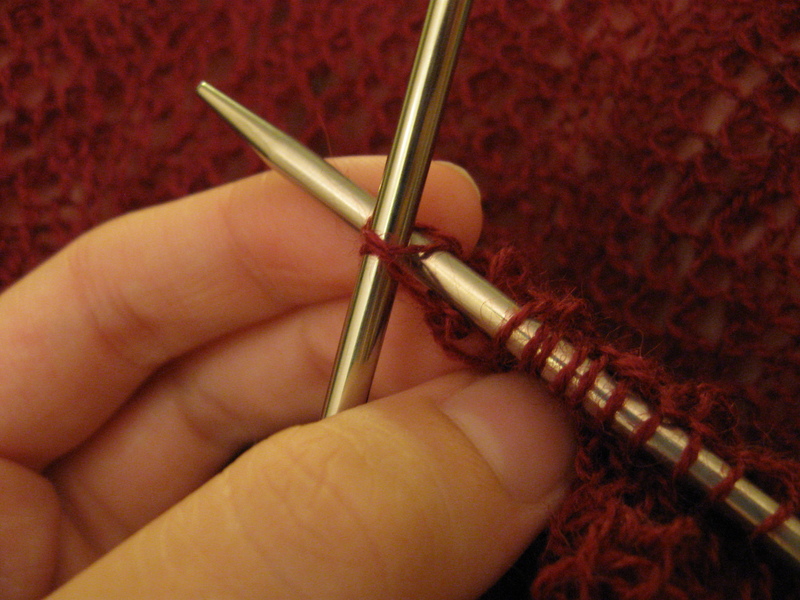 The hardest parts were finding the yarn and adjusting the pattern for the bulky yarn we settled on, but other than that it was a breeze. 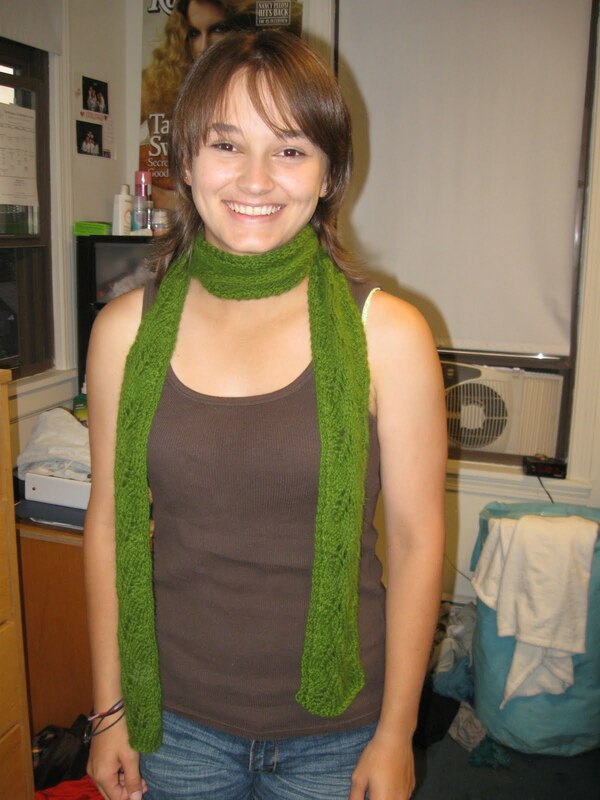 This pattern came from the book Charmed Knits: Projects for Fans of Harry Potter, by Alison Hansel. That book is a godsend! 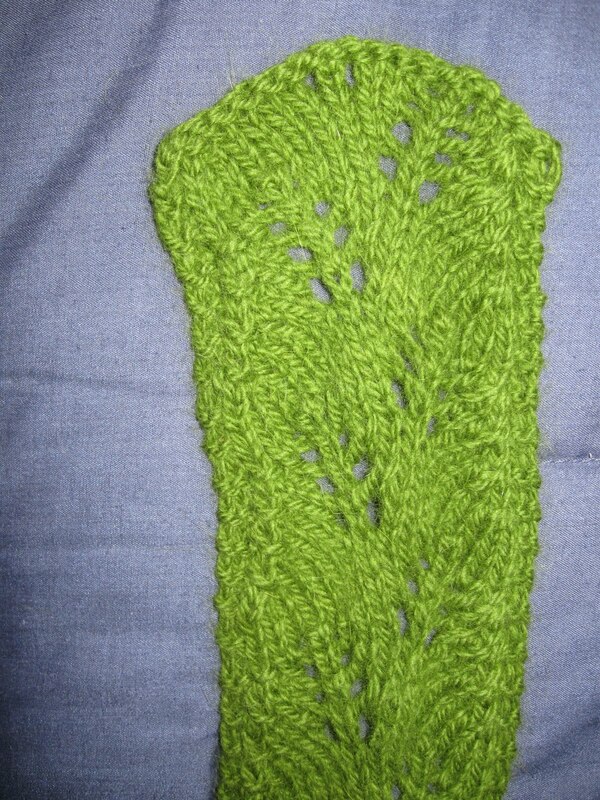 I had been dying to make a scarf with a leaf pattern for some time, but I was waiting until I found yarn that was the perfect shade of green. I finally found it for three dollars a ball with only two balls left in the backroom at Webs! 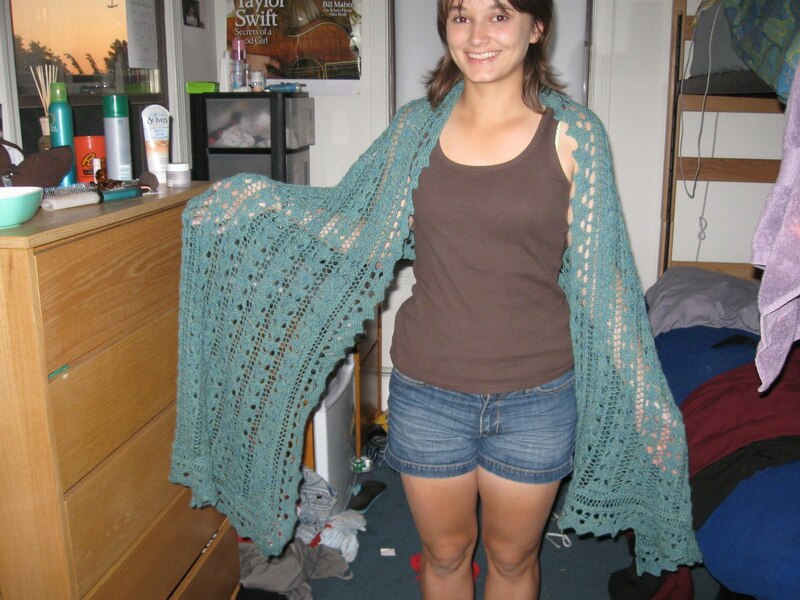 The pattern comes from knittingpatterncentral.com, a great source for free knitting patterns. 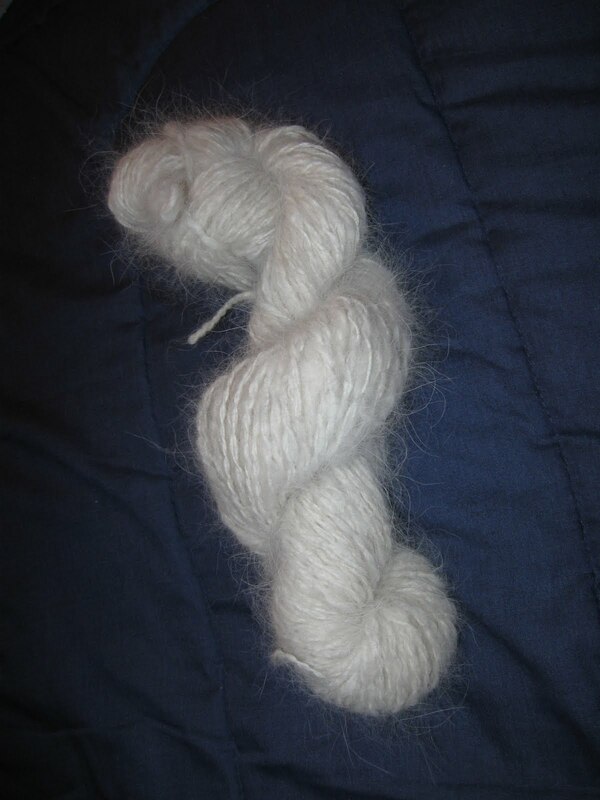 This is some yarn that I have spun. 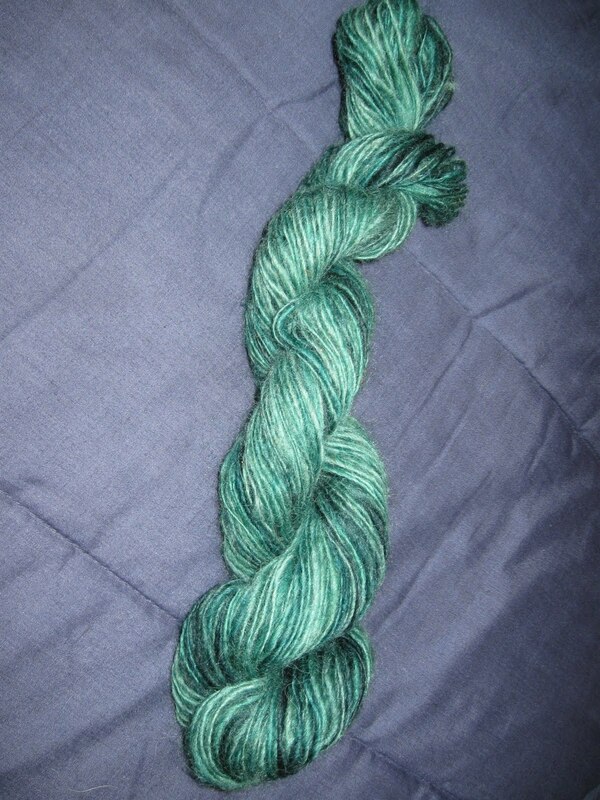 The silver is unknown fiber (I suspect merino top, but it was so long ago now that I don’t remember), the green is merino and wool, and the white is Great Pyrenees dog fur. My friend (and Karen’s sister-in-law) Judy works at a Pyrenees rescue shelter and owns several of them herself. A few years ago Judy helped organize a fair about Pyrenees and rescuing them in particular, and Karen and I went to support her and do a spinning demonstration to show how the fur of this amazing dog is a wonderful, warm, beautiful fiber to work with. And they shed like crazy, so it works out perfectly! 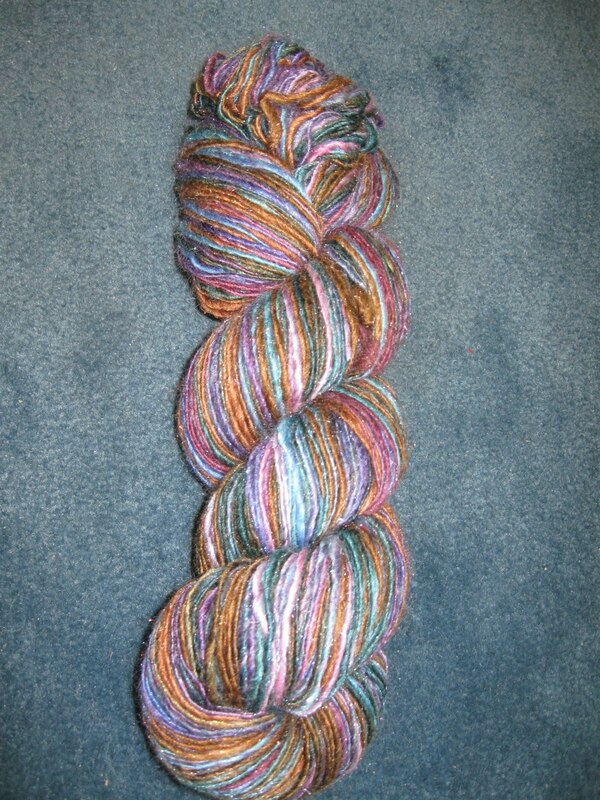 This yarn was so much fun to spin! (Although I had a spinning wheel malfunction when I was 2/3 of the way done which reduced me to a hysterical mess for about an hour. Ahh, nothing like fiber to put you in your place). 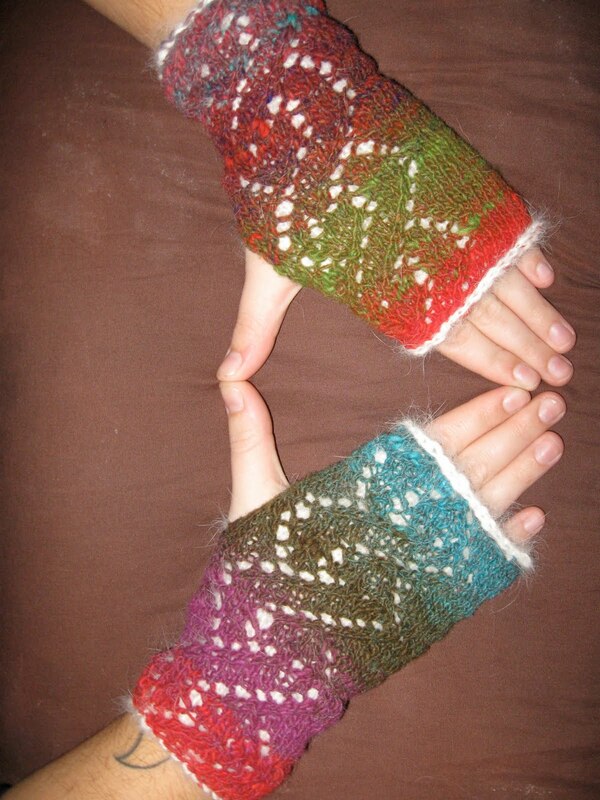 These fingertip-less mitts are a work in progress right now, and are partially of my own design. 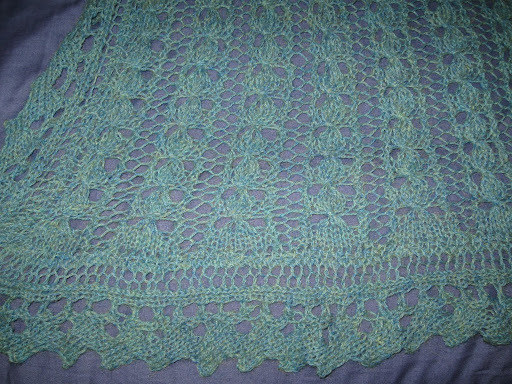 The design down the center is a modified version of a lace bookmark pattern that came in a knitting Day-to-Day calendar that I bought a few years ago. I changed a few things around and combined it with a basic pattern for fingertip-less mitts that I got from an unknown source (Karen, probably), and viola! The white is paper that I put in them to show what they will look like when they are done. 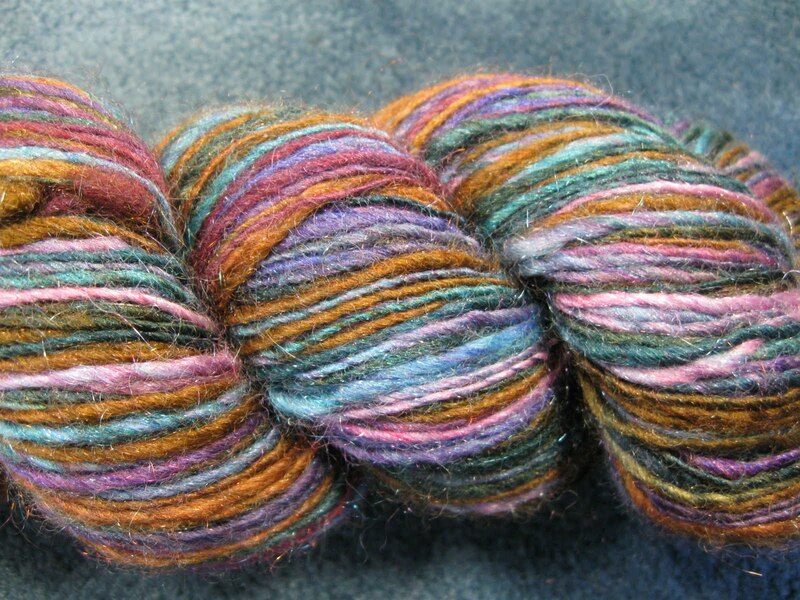 They are knit in Noro silk, but I am going to line them with some white and fluffy angora that Karen spun up for me – she’s the best!